Over the past decade, You Me at Six have gained a reputation as one of the UK’s finest rock bands, scoring number one albums (Their 4th album ‘Cavalier Youth’ topped the charts in 2014) and playing to massive audiences around the globe. Whilst they have retained the punkish and youthful energy that helped their 2008 debut ‘Take Off Your Colours’ stand out from their numerous contemporaries in the late 2000’s pop punk and emo scene, the band’s sound has consistently evolved over the course of six albums, culminating in the release of their most musically diverse and experimental album yet in this year’s ‘VI’. Playing in the Welsh capital for the first time since their set at the Motorpoint last April, the band delivered a heroic performance that showcases exactly why they have earned a name for themselves as one of the countries premier live bands. The night got off to a fine start thanks to a stunning set by Scottish three-piece The Xcerts. Coming off the back of releasing one of the year’s best records (the excellent ‘Hold On To Your Heart’) the first support act played with the conviction and passion of headliners, winning the Cardiff crowd over with their joyous and instantly likeable brand of soaring guitar pop. As the band’s lead singer, Murray Macleod, closed their set by belting out the hook to the anthemic ‘Feels Like Falling in Love’ a capella, it was clear that the band had gained many new fans with their set, myself included. After a short break, Marmozets took to the stage. The Yorkshire based 5-piece delivered a fierce set that drew heavily from their most recent album, this year’s ‘Knowing What You Know Now’, whilst also incorporating several tracks from their 2014 debut ‘The Weird and Wonderful Marmozets’. However, whilst the band’s musicianship and strong song-writing still shone through, on stage the band unfortunately lacked the degree of energy and stage presence exhibited by the bands they were sandwiched between. This was particularly disappointing considering the band’s talent and when contrasted with the kind of raw energy that they have been known to deliver live in the past (something I witnessed during the set at Reading Festival in 2017). After another short interval, the lights in the Great Hall dimmed once again in preparation for the headliner’s performance. As the menacing electronics of set opener ‘Fast Forward’ played out and stage obscuring smoke enveloped the stage in an atmospheric embrace, the band took to the stage. The drum machines and synths were soon replaced by crashing drums and a thunderous riff as the smoke began to evaporate, and the set began. The band held the rapturous crowd in the palm of their hand for their whole set, which drew from the entirety of the band’s back catalogue. The band’s frontman, Josh Franceschi, has a stage presence that is both confident and warm, and greatly added to the communal atmosphere of the event. The group’s confidence as performers and love of their craft shone through, as did their sense of humour, notably when they acknowledged the similarity between their 2011 hit ‘Reckless’ and the Killers ‘When You Where Young’ by playfully interpolating the two. In a particularly moving highlight of the set, Franceshi honoured his Welsh roots by dedicating the gorgeous power balled ‘Take On The World’ to his Welsh mother, who sadly passed away this year. 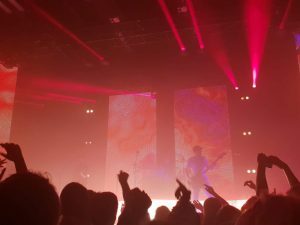 As the band closed their main set with the raucous ‘Bite My Tongue’ (a 2011 collaboration with Bring Me The Horizon frontmen, Ollie Sykes) anticipation built as the crowd opened up, before descending into a series of sweaty mosh-pits. After a brief interlude, the band returned for a triumphant encore, closing with 2010 fan favourite ‘Underdog’. As the night drew to a close, You Me At Six left the Cardiff crowd exhilarated, exhausted and satisfied.